With the frenetic pace of life in today's Internet-driven world continuing to accelerate – where things can change before you've even finished reading this article – it's easy to forget about the behaviors and values that give our lives purpose and special meaning. Maybe it's time to step back a bit and see how someone else is doing it. You could follow the example of Henry Ford. When asked the question, "How much is enough?" he is said to have replied..."Just a little bit more." Or you could take a page from Jim Teeny's playbook. 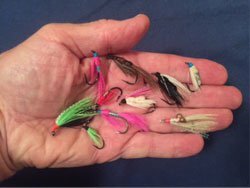 Since 1962, when Jim's late father suggested that he might catch more fish on an "ugly" fly than a pretty one, he has been tying what has become in the fly fishing world, an iconic pattern – the Teeny Nymph. Jim's fly pattern has held over 30 International Game Fish Association (IGFA) World Records, and, as he notes, "We've probably released another thirty-five or forty fish in addition, just because we didn't want to harm them." Over the last 44 years, Jim has caught and released dozens of fish species on his Ring-necked Pheasant 3-variation pattern, tied using less than two dozen colors of tail feathers and a dozen hook sizes. For inventing and popularizing this "simple" pattern, Jim's template was featured as "The Fly of the Year for Oregon" at the 2014 Federation of Fly Fishers Conference in Albany. When buying silver, skip the fancy commemoratives in the ads for big-premium "Happy Valentine's Day" bars or "limited edition" animal mintages. 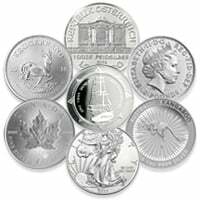 Stack your silver by getting one ounce tubes of bullion rounds and bars weighing 5, 10, 20, or 100 ounces apiece – and yes, some American Silver Eagles – the world's most popular silver coin. Better yet, grab the new Silver Kangaroo released worldwide just this week at lower prices than all other sovereign silver coins. For gold coins in affordable premiums, consider American Gold Eagles and Buffaloes, 1 oz Canadian Maple Leaf gold coin from Money Metals Exchange, and perhaps a beautiful Gold Kangaroo from the Perth Mint. In Fishing and Investing, Look for the "Real Deal"
Whether stalking fish or precious metals, "go where the big ones are known to be." Jim Teeny targets streams and lakes in various locales around the world that have proven over time to hold large numbers of big trout and salmon, offering him a good return on the time and money spent. Purchase your silver, gold, and palladium from a trusted source who honors their word with a history of strong customer service. You might rightfully hesitate traveling to a remote fishing spot based upon a third-hand rumor, without more substantial evidence from someone reliable who's actually been there. To protect yourself, strive to buy precious metals the same way. Migratory salmon and trout are only found in their native rivers at certain times during the year. If you're too early, you may end up working an empty stream and go home skunked. With precious metals, "being early" simply means that you're likely to get a much better price than if you waited until "the run is on." Stack your coins ahead of time, then relax and enjoy the trend while others are fretting about how and where they're going to get theirs. The time has never been more appropriate to take a position in gold and silver. You're much better off being quite a bit early... than a day or a week too late! Jim closes one of his instructional videos by saying, "The Teeny Nymph has worked for me for forty-one years, and I'm just telling you, that you're going to do just as good as I am on this pattern. Give it a try." For several thousand years and across cultures, people have chosen silver (and gold) as insurance, as real money, and nowadays – especially in the case of silver – as "health insurance" for medicinal purposes and in over 10,000 industrial applications. Inspired by Donna Teeny, Jim offers products specifically at JimTeeny.com designed for Casting for Recovery, a non-profit educational program for women surviving breast cancer, and Project Healing Waters, a non-profit organization teaching fly fishing and fly tying skills to American servicemen and women. As a precious metals owner, you also can do both good and well. Give a tip, a gift, or maybe even help someone on the street. When an opportunity presents itself, rather than offering what David Morgan at TheMorganReport.com refers to as "paper promises," donate a small amount of real money. Unlike every form of paper currency ever issued, it has never seen its value fall to zero! Place a one-tenth ounce .999 fine silver round in someone's palm – and watch their eyes light up! 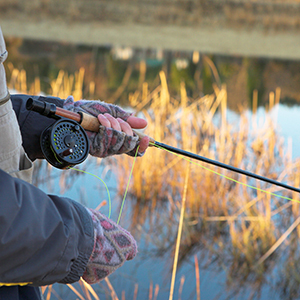 Whether it's fly fishing, buying precious metals, or some other activity that you decide to pursue, it doesn't have to be complicated. It isn't necessary to make a huge leap in perspective or practice in order to succeed for yourself while helping others. Most of us know in our hearts what's right. If you're not satisfied with how things are flowing right now, chances are the way you're going about it will only involve a "teeny" change!